The Ship The Americas Cup Is Named For. America is available for Whale Watching, Harbor Cruises, Sunset Sails, and Charters. Next Level Sailing docks this famous yacht at the Maritime Museum of San Diego. She is not open to be boarded by the public, but you can view her magnificence from our docks when she isn’t out sailing! The 139-foot America is a replica of the low black schooner famous for winning the historic Royal Yacht Squadron’s “100 Guinea Cup” race around the Isle of Wight. That trophy was donated to the New York Yacht Club to be held as a challenge trophy, and it came to be known as the America’s Cup. 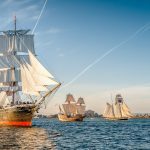 The America can host up to 80 guests and is available for sunset sails, whale watching, dinners, corporate events and even ocean-going overnight sails. Set sail on this classic sailing vessel who’s bow slices cleanly through the ocean swells. You’ll enjoy one of the smoothest boat rides you’ll ever experience! A classically designed, spacious, grand lady, this huge schooner will take you on an unparalleled adventure. AMERICA – This magnificent sailing vessel is a replica of the 139-foot yacht (AMERICA) that won the historic, Royal Yacht Squadron’s “100 Guinea Cup” race around the Isle of Wight in 1851. The trophy was donated to the New York Yacht Club to be held as a challenge trophy, which came to be known as the America’s Cup. Our America is a replica that was built in 1995 at a cost of more than $6 million. At 139 luxurious and awesome feet in length, and capable of hosting up to 76 guests, she is a treat for anybody aboard her for Sunset Sails, Whale Watching, Dinner Functions, Corporate Events, or exciting ocean-going overnight sailing adventures. An ‘America’ sail can be customized for any time of day or activity. Click Here for Tickets & Availability.